A healthy female patient at 20 years old. Her mother brought her to our outpatient department upon noticing the girl's unbalance of the trunk. The girl had no obvious uncomfortableness. 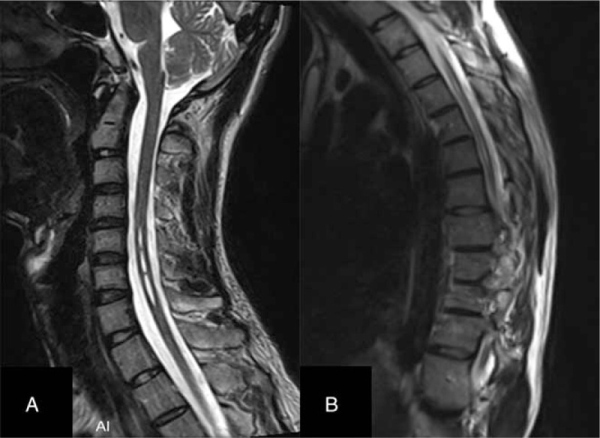 Preoperative CT scans of the whole spine was performed, and the image data was burned on a CD that could be recognized by the computer-navigation workstation so as to facilitate preoperative design, including the length, diameter, and trajectory of pedicle screws.The patient was placed in prone position after general anesthesia took effect. The posterior structures of T5-L3 were exposed. A patient tracker for locating the patient's spatial location was installed on the spinous process of T5 vertebra. The SpineMap 3D 2.0 (Stryker Navigation, Kalamazoo, MI, USA) software was selected in Navigation System workstation. The C-arm tracker, the patient tracker and the surgical instrument tracker (Stryker Leibinger GmbH & Co., Freiburg, Germany) were activated in turn. We finished image acquisition after 190° scanning at the segmental lesion and made automatic fusion of scanned image intraoperative and CT image preoperative. We chose SVMN in the workstation and moved the position of the surgical instrument until the direction of surgical instrument was completely consistent with the planned trajectory preoperatively. The surgical instrument was not inserted until the lower right corner of the screen turned green. 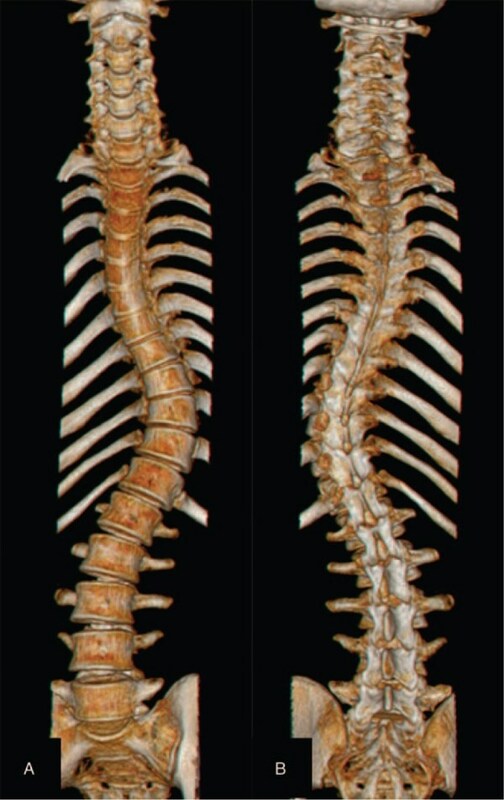 Then scoliosis was corrected. Anteroposterior position and lateral X-rays were performed intraoperatively to examine the position of inserted screw. A multimodal intraoperative monitoring system was applied throughout the operation, mainly monitoring motor evoked potentials and somatosensory evoked potentials. Brace was used for 3 months after operation to ensure the stability of the spine. The surgical complications, the operation time, and the bleeding volume were collected from the medical records. The frontal and lateral of total spine X-rays were taken and CT image was scanned postoperatively. We estimated the position of pedicle screw reported by Ughwanogho et al. The clinical pictures were also collected postoperatively. The blood loss volume was 768 ml, and the operation time was 186 minutes. The distance between the CPL and the CSVL was improved from 56.2 mm to 0.2 mm, and the sagittal imbalance of 35.8 mm was reduced to 3.5 mm. The main curve was 3.5° postoperative with 93.6% correction rate. 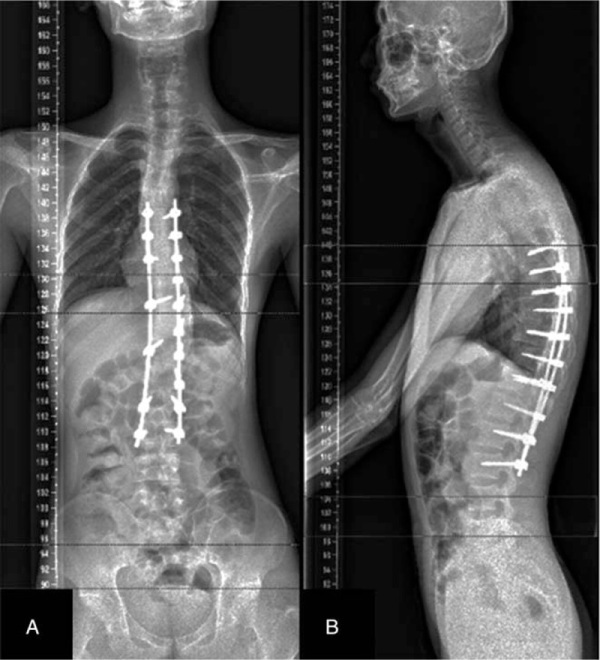 The segmental kyphosis (T5-T12) was 32° after surgery with 43.6% correction rate. No screw misplacement and neurological impairment were found postoperatively. No curve progression, pseudarthrosis formation, or loosening of pedicle screw was discovered during 33 months of follow-up duration.